Sewing is my passion. I found my real hobby just after my marriage. My mother was a sewing and crocheting artist. She used to teach crocheting and sewing clothes. Watching her amazing works, I developed similar interests ever since. Years passed by. In 2008, I went to further my studies in USM, Penang and set up a small kiosk that catered specifically to the students. It was named ‘Balqis House’. I spent my mornings studying and in the evening I baked bread and other homemade food to sell. I put a lot of effort to nurture my business. 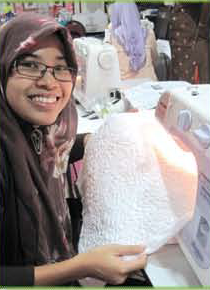 After I got married in 2009, I regained my passion in needle crafting and I began to develop an interest in sharing my passion and skills with other women. I worked for 2 years after I graduated but I realized then that my job was not fulfilling enough for me. I finally made up my mind to resign and started my needle crafting business under Balqis House. Grass Greener On The Other Side? People in general always want what they don't have. And in a way, I'm no different. As a dialysis patient, I had to have surgery on my left arm to insert a fistula, which in layman's terms means that one of my main arteries in my left arm is 'joined' to a main vein in my left arm to my heart so that through this, the dialysis machine can get to circulate my blood to clean it. I'm sorry I can't explain any better, but that's the gist of it. This surgery has left a very obvious and ugly scar on my upper left arm. As a result, I can't wear anything sleeveless anymore because it's way ugly. Neither can I wear halter necks, spaghetti straps or anything shoulder-less. So, when I see an attractive woman with a halter-neck dress or blouse, for instance, I can't help longing to wear something similar but I never can now because my scars are just too obvious. After contemplating whether to use up the leftover egg whites either for a pudding or any cookie-like dessert, I finally settled for the latter. Why? Because this recipe is super easy and the last piece is normally fought over. So I can be sure that none will be wasted. 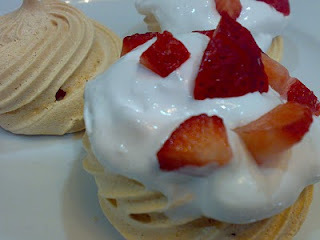 This is one recipe I have been using to make either a gooey or crispy-dry mini pavlovas. Baking in a very high temperature in a short time will produce pavlovas that are moist, gooey and sticky on the inside. On the other hand, low-medium temperature and longer time are needed to produce dry and crispy pavlovas. However, if you oven is pretty dodgy (like mine sometimes) I suggest that you watch the pavlovas closely while they bake. What you need are 3 egg whites, 1/4 cup of granulated sugar, 1 tablespoon of cornflour, a pinch of salt, 1 teaspoon of lemon juice and 3/4 cup of caster sugar. Since I'm making dry mini pavlovas, I'm going to set the oven at a low-medium heat (140C).